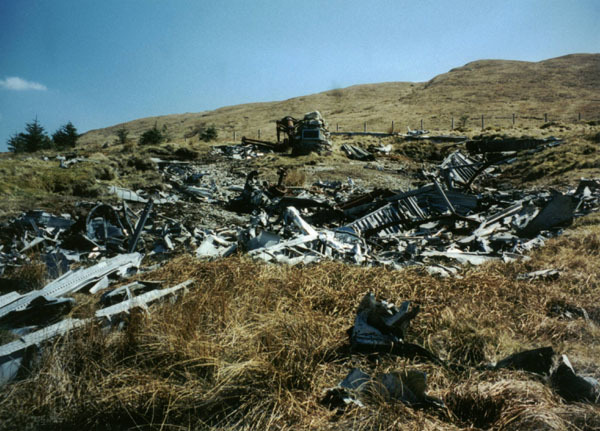 The Scottish hills are littered with the remains of crashed aircraft. The majority came down during the last war and most were just left to lie where they fell. For many years walkers have sought out these wreckages. In some cases fairly extensive debris can still be found, while in other cases souvenir hunters have pretty much stripped crash sites bare. Printed below is a list of known sites and our intention is to update this as time goes on. If you visit one of these sites, or know of any others, please drop us a line with details of what you find so we can share it with others. In each case the grid reference is followed by (where known) the type of aircraft involved, when it crashed, and where it was from. 212717 Heinkel 111. Crashed at Vaasetter, Fair Isle. 550566 Fairfly Albacore. Loch Fhionnaich, near Tongue. 543665 Whitley. Embedded in moor on north slope of Ben Hutig. 759457 Wellington. Wreckage on remote open moor near Meall Ceann Loch Strathy. 976153 Liberator. Rear turret, main body. NG 812716 USAAF Liberator. The USAAF crew of nine and six passengers took off from Prestwick on June 13, 1945, returning home after the war. The B-24H left at 1315 hours from Prestwick on a route that should have taken it over Stornoway, but we can only guess at why it came over the mainland. A navigational error, instrumental or engine failure, all are possible. For whatever reason, to find themselves descending through thick cloud to attempt an emergency landing must have been fearsome. It seems the aircraft struck the top of Slioch and lost some bomb bay door parts. The descent continued until they broke through the cloud base over Gairloch. They circled once round the loch, possibly looking for a place to ditch, and may have decided on the sea loch itself. The aircraft was on the run in when they just failed to clear the rocky spurs by the Fairy Lochs. All crew and passengers were killed. This site is reached by parking in a sandy lay-by across the road from Shieldaig Lodge (on the B8056 Redpoint road), and walking back up the road, to a small ford on the burn and following the good right-of-way path past the ruined farm. After a few hundred metres, keep an eye out for a cairn on the left hand side, marking a small muddy path climbing quite sharply up the hill side through some small trees. Follow this, and take the right hand fork that skirts round the side of Sidhean Mor. On reaching the first loch, keep to the right again, round the shore, and you can't miss the wreckage strewn everywhere, in the Fairy lochs, and on the hillside at each side of the lochans. There is a war grave with various artifacts around. Please don't remove anything (Thanks to Scott Niven for this info. Check out his website for some walks in the Gairloch area). 544689 Sea Hawk. Small remains in Glen Glass, near Evanton. 642957 Catilina flying boat. Crashed into the hillside on Vatersay while on a night exercise. The remains include some bits of the wings and cabin, but no engines (Thanks to Jelle Muylle for info and photo). 965000 Oxford. Wreckage scattered down burn below Braeriach in Lairig Ghru. 112025 Airspeed Oxford serial no. PH404, 311Sqn, crashed January 10, 1945, en route "somewhere in England" to Tain. I was on the Beinn a'Bhuird plateau up the far NE corner on a top called Stob an t-Sluichd. Just short of the summit, almost at the crest of the ridge, lay two aircraft engines which, from my very limited knowledge of such things I'd describe as 7-cylinder radial engines with wooden propellers (bits of wood still in situ). One engine carried a plate with serial number RM7676 (Thanks to Richard for this info). 190740 Handley Page Halifax, 01.06.44. 986992 Avro Anson, 21.08.42. Ben Macdui. Navex from Kinloss. Anson, DJ106, 19 OTU. There is a small memorial about this crash on the site (Thanks to Paul Warrener for additional info on this crash. He runs a website about No 19 Operational Training Unit, Forres, which can be found at www.19otu.org.uk). 089964 Vickers Wellington, 23.10.40. Bruach Mor. 9972 RAF Hercules, 27.05.93. From RAF Lyneham. On May 27, 1993, an RAF Hercules en-route from RAF Lyneham to RAF Lossiemouth crashed into the base of Glen Loch just after 4pm with the loss of all nine lives on board. A local estate worker who heard the noise of the impact raised the alarm and helicopters from Lossiemouth, Bulmer and Prestwick were dispatched to the scene, also attending were fire brigade units from as far afield as Dundee to fight the blaze which engulfed large areas of the glen. The cause of the crash is largely unknown, as the aircraft was not carrying a black box. Local people reported a strange sounding aircraft flying low over the villages immediately prior to the time of the crash and engine failure whilst flying at a low level could have been the cause. Whatever happened was very quick - the aircraft's speed is believed to be in the region of 250mph with the crew having no time to send a distress call before the impact. The location of the crash is still visible today by a scar in the vegetation although all but a few items of wreckage and personal effects remain at the cairns which overlook the scene. Three cairns exist - An official RAF memorial, a plaque from the Air Training Corps and a small cairn erected by the family of Sgt Craig Hillard, the air loadmaster on the flight who lived in Inverness. Walkers passing the site should respect the nature of the event and the memorials and leave the scene as found. I have passed this site regularly over the past few years and its clear that some sad sod has helped themselves to various items near the cairns (Thanks to Steve Page for this info). 381761 Wickers Wellington L7845 OTU from Kinloss, crashed on Tom Titlach on August 9, 1942. There was one survivor (Thanks to Billy Milne for this info). 324808 Armstrong Whitworth Whitley, crashed 26.05.44. This was Whitley EB384, of No 19 OTU, RAF, flying from Forres on a cross country navigation exercise. The mountain rescue team that located the crash reported the aircraft was completely burnt out (Thanks to Paul Warrener for additional info on this crash. He runs a website about No 19 Operational Training Unit, Forres, which can be found at www.19otu.org.uk). 215762 Armstrong Whitworth Whitley, believed to have crashed on 24.03.42. Kinloss. This was Whitley Z6933, of No 19 OTU, RAF. It was posted missing on a Navigation exercise and subsequently found on Finalty Hill (Thanks to Paul Warrener for additional info on this crash. He runs a website about No 19 Operational Training Unit, Forres, which can be found at www.19otu.org.uk). 493884 Avro Vulcan, 12.06.63. 44 Sqn training flight from Finningley. 515739 Bristol Beaufort, 08.03.42. 217 Sqn Leuchars/Wick. 521733 Liberator, 17.10.44. Anti-sub patrol from Leuchars. 351806 De Havilland Mosquito, 17.08.43. Leuchars. 206845 Canberra, 22.1.56. 50 Sqn. Wreckage scattered, but some fairly large bits on north-east slope of Carn an t-Sagairt Mor (see photo on right of wing just below) and in bealach between Carn an t-Sagairt Mor and Carn an t-Sagairt Beag. 277784 Fairey Albacore, 01.05.41. 767 Sqn. 263848 Fairey Firefly, 16.05.49. Yellow wreck from Lossiemouth. 204801 Fairey Swordfish, unknown, complete in a heap. From Arbroath? 323706 Fairey swordfish, 15.12.40. 769 Sqn Arbroath. 230720 Hawker Hurricane, 21.04.43. Local flight from Tealing. 558732 Hawker Sea Fury, 16.09.53. East Wirren from Arbroath. 572816 Miles Master, 15.12.42. From Montrose. 584775 North American Harvard, 06.09.54. Kinloss/Leuchars. I tried to locate this crash site a few weeks ago but found nothing - I thought my navigation might be out or that grid reference was erroneous. However, I spoke to local gamekeeper who told me he was very familiar with the area the crash site was supposed to be in and that he had only ever found one piece of wreckage there - so, grid reference is probably accurate enough but site has been virtually completely cleared at some stage with only very small fragments of wreckage to be found - unless anyone has information to the contrary (Thanks to Hugh Ramsay for this info). 589899 North American Super Sabre, 07.08.69. Pilot Ejected. 350700 Supermarine Spitfire, 10.11.42. Small pieces. 391736 Airspeed Oxford, 24.08.50. Turnhouse/Dyce. 273264 Lockheed Hudson, 15.04.41. Ben Lui. Anti-sub patrol. 25-27- Sepecat Jaguar, 23.11.79. Beinn A'Chleibh. Lossie. 155305 Super Sabre, near Dalmally. 420932 Avro Lancaster, 13.09.44. Conic Hill mid air break up. 157983 Grumman Martlett, 13.12.40. Ben Bheula. 620163 Scimitar. Small remains to the south of Ben Vorlich near Callander. 497737 Barracuda. Crashed in the Paps of Jura.